Automobilia is one of the largest and perhaps most prestigious markets today. The high prices achieved at auction for automobilia, classic cars, classic motorcycles, rallying and Formula One is fuelled by nostalgic collectors driven by their passion. 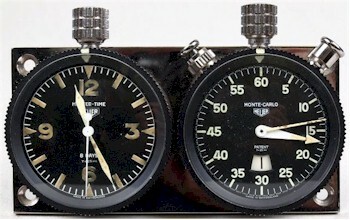 A Heuer Rally Master chronometer set, which was sold at auction for £1,250 in a Sporting and Collectors sale. It is no wonder that, when an unassuming house clearance revealed three classic cars and a classic motorcycle, the saleroom was full on the sale day. The motorcycle in question was a Mark II Ariel Square Four from the 1950s, a period many buyers can remember owning their first motorcycle. Enthusiasts weren't put off that it had lain at the back of a garage for a number of years and helped the bidding to £9,000. The 1950s and 1960s are considered the Golden age of motorsports, with many collectors eager to obtain items from their childhood. Photographs taken by members of the crowd at Formula One events at a time when everyone and anyone could wander around the pits often showed an unseen side of the sport. 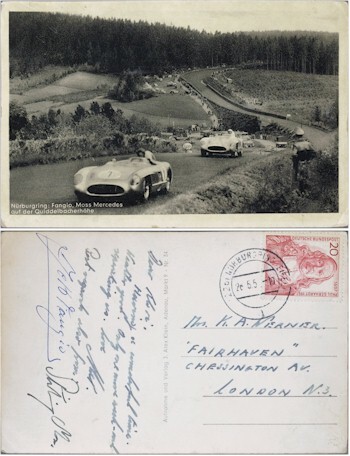 A signed postcard with photograph of Juan Manuel Fangio leading Moss around the Nurbergring in a Mercedes W196 (SC15/384). A unique, single-owner collection of black and white photographs and memorabilia, attracted international attention to sell for over £10,000 in total. One of the highlights of the collection was an album covering the fateful 1955 Le Mans race that sold to a collector for £1,250. As well as complete classic cars and classic motorcycles, parts and accessories can often be found at auction. As one of the first official timekeepers of Formula One events, Heuer produced a series of chronographs and chronometers for rallying and motor sport. As advertising became more prolific in sports with sponsorship and branding, companies such as Hanhart gave chronographs to the Ferrari team for the 1970 season. Trains, planes and automobiles were the inspiration behind many themes of decoration of the Art Deco period. The age of modernity was new and exciting with the development of airships and the first commercial flights from London's initial airport at Croydon. Items from early advances in flight technology and development are sought after by collectors. Even simple desktop models of wooden props attract bidders. Full size props from Sopwith and Avro aeroplanes are not only available but so are related items of furniture, picture frames and clocks. Aluminium was a modern wonder material for early aeroplanes and was used for handles of button hooks and dressing table sets.